Vitiligo (vitiligo Latin “Lichen, skin disease.”; Leukopathia med acquisita, Greek λευκὀς “white” πἀθος “suffering” Latin acquisita “acquired”) or white spot disease. Typical are pigment disturbances in the form of white, pigment-free skin patches. According to recent findings have affected cells to a high content of hydrogen peroxide (H2O2), which prevents the formation of melanin (coloring of the cells). This condition is reversible, even after years of decline of H2O2 can again lead to repigmentation. Vitiligo often occurs not only on, but is partially accompanied by autoimmune diseases, such as in thyroid diseases, such as Hashimoto’s thyroiditis, diabetes mellitus type stress can also be a trigger. 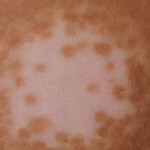 Vitiligo is incurable today. The use of sunscreens with a high SPF is recommended. Steroids, calcineurin antagonists, UVA, UVB or PUVA therapy excimer laser (308 nm) can be used. Average treatment times of six to twelve months are expected to be conducted in the form of many short, regular sessions. In the case of UV-irradiation no previous malignant tumor should be present. In special cases, autologous melanocytes (donor and recipient are the same) are grown and replanted. Camouflage or taking higher doses of β-carotene are more options for symptomatic therapy. The main alkaloid of black pepper, piperine seems to stimulate pigmentation according to current studies.